Here’s a piece consultant research that’s definitely worth reading. Cambridge Associates’ paper Hallmarks of Successful Active Equity Managers tackles the question of how to identify which equity fund managers are likely to beat the market. The team at Cambridge set out to test the relationship between active share (for an explanation of active share, please read my earlier post Beating the Market Part 3 – “Sheep Get Slaughtered”) and performance in institutional portfolios, including US large-cap, US small-cap, and non-US (EAFE) managers. They also investigated the impact of investment management fees on performance. In summary. Our results also highlight the difficulty inherent in generating strong relative performance after fees from a portfolio that closely mimics its benchmark. Investors that choose low active share managers leave themselves very little margin for error in manager selection, while investors that select higher active share managers may experience better returns. Cambridge used the eVestment Alliance database of active equity fund managers from October 2007 through to June 2013. The sample represented 90% of managers who published investment returns as of October 2007 (887 US large-cap, 483 US small-cap and 129 EAFE fund managers). Survivorship bias wasn’t a big issue as less than 2% of the managers in the sample dropped out over the study period. As Table 2 shows, the majority of fund managers had an active share below 80% (with the exception of US small-cap managers). The level of active share matters because. In general, the term “closet indexer” is applied to managers with active share below 60%… As we will show later, closet index portfolios are likely too similar to their benchmarks to deliver significantly differentiated returns, especially after fees. 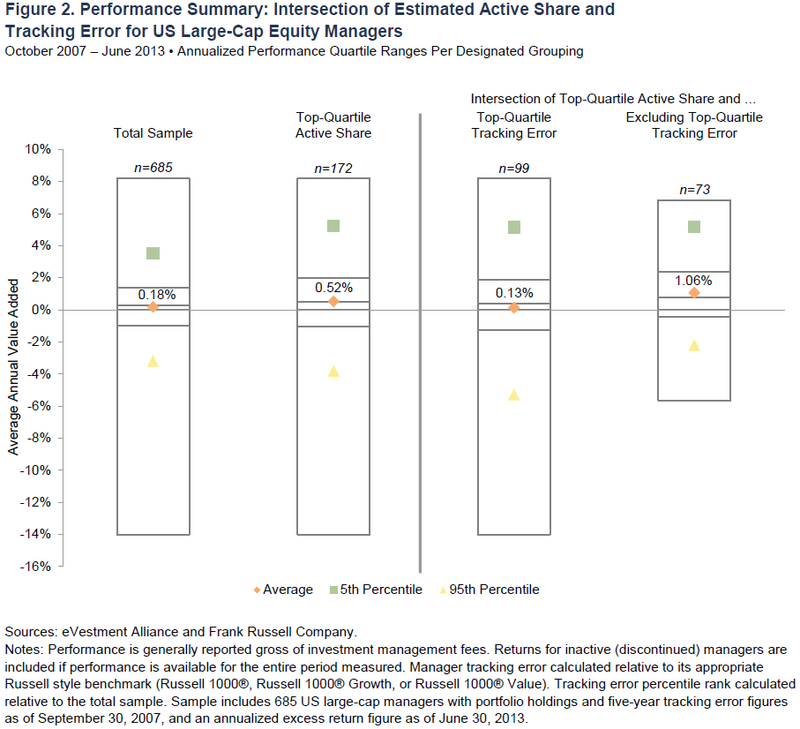 Active share levels above 80%, on the other hand, are often considered to reflect a “truly active” manager. In other words, only 25% of US large-cap and 50% (approximately) of EAFE active equity fund managers can be considered to be truly active. The rest are just too similar to their benchmarks to have much of a chance of beating the market after fees, costs and taxes. The average highest-quartile US large-cap active share manager outperformed the lowest-quartile manager by 0.73% per year gross of fees. Generally high-active share managers charge higher fees (the study found that the fee premium was 0.16% per year). Even after the higher fees, investors were still, on average, better off by 0.29% per year. The average low-active share fund manager or “closet indexer” wasn’t even able to recover the cost their management fee! Cambridge also investigated the relationship between portfolio concentration and performance. Active share and portfolio concentration are related, as in most cases a portfolio with fewer individual holdings will, all other things being equal, have a higher active share. 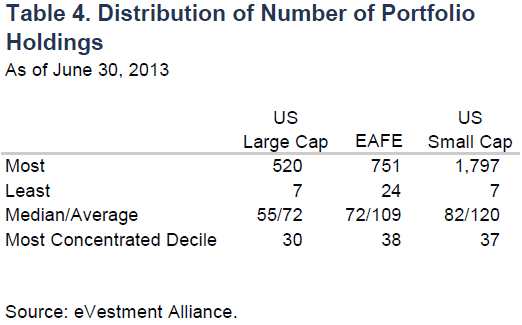 Table 4 shows the distribution of the number of portfolio holdings across the sample managers. The median fund manager held between 50-90 stocks, which is arguably too many ( see the quotes from Peter Lynch and Joel Greenblatt in my earlier post Beating the Market Part 3 – “Sheep Get Slaughtered”). The paper explains. 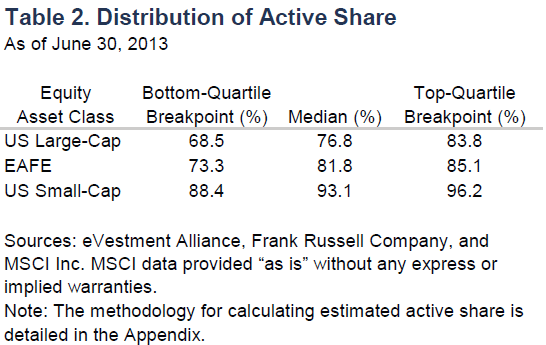 Most active portfolios are probably over-diversified. When a manager’s 40th or 50th best idea is added to a portfolio, the marginal gain in either risk reduction or return enhancement is likely minimal. Studies indicate that an equity portfolio needs only 30–40 stocks to eliminate most of the diversifiable absolute risk (as defined by the standard deviation of the portfolio). Although similar studies suggest that at least 100 stocks may be needed to limit relative risk (as defined by tracking error), investors with a multi-manager portfolio can achieve exposure to 100 stocks by, for example, hiring five concentrated managers with 20 stocks each. The key point is in the last sentence. Investors worried about under-performing the market would, in most cases, be better off investing in a handful of carefully-selected concentrated fund managers rather than investing in a single overly-diversified fund manager. As you’ve probably already guessed, the more concentrated fund managers have the better results both before and after investment fees. Highly concentrated fund managers are usually associated with higher tracking error, although as Table 6 shows this is not always the case. The correlation between concentration and 3 year tracking error is moderate, while 5-year tracking error is quite low. A high level of tracking error may signal that a portfolio’s relative performance is dependent on the success of a small number of factor bets. If so, the portfolio’s performance over a given period may be more dependent on the market’s appetite for those factors than the manager’s security selection ability. Investors should consider whether they wish to have exposure to these factors. Some factor tilts may be desirable on a permanent basis, including those to the value, small size (i.e., exposure to small-cap stocks), or momentum, all of which have well documented long-run performance benefits. Others, such as industry bets, may have less basis for permanent exposure in both theory and practice. As we examine in the next section, active portfolios with meaningful factor biases can be susceptible to larger relative return drawdowns than similarly active and/or concentrated portfolios, and they may not offer symmetrical upside to compensate for these losses. Figure 2 confirms that investors choosing fundamental active equity managers should focus on selecting stock pickers with factor exposures that are not extreme. As the box on the left shows, fund managers with high active share and reasonable tracking error (less than top-quartile) deliver the best performance; beating the market on average by 1.06% per year. Not only do they beat the market, they also do it with less risk of under-performing. The very worst high-active share, high-tracking error manager underperformed the market by -14% per year, while the very worst high-active share, moderate-tracking error manager underperformed the market by -6% per year. Of the 685 fund managers in the tracking error sample, only 73 or 10.66% were high-active share, moderate tracking error managers. If high active share, concentrated, moderate tracking error works, then why are there so few fund managers managing money this way? Cambridge explains. …While we suggest keeping a close eye on extreme tracking error, the general increase in relative performance volatility associated with increasing active share or portfolio concentration can increase the volatility of economics (business risk) for a manager’s business. Any increase in business risk can, in turn, be compounded by the capacity limitations noted above, which can make a manager’s AUM both smaller in size and more volatile. This potential business risk is a key reason many managers develop strategies with low active risk, which potentially deliver more muted relative performance but more business stability. Many investors, too, are more comfortable hiring less risky, more stable firms—potentially leaving a performance premium available to investors that are willing to tolerate higher manager business risk. Unfortunately fund managers have a conflict of interest often referred to as the principal and agent problem (See my post: Beating the market: Why do most institutional investors underperform?). As the quote from Cambridge highlights, what’s good for the client (the principal) isn’t always good for the fund manager (the agent). Running a concentrated, high-active share portfolio limits the amount of money that fund managers can make. To be fair, fund manager’s aren’t the only ones at fault. Research suggests that their institutional investors are only too ready to sack them during a period of poor performance (please see my earlier posts The parable of the seven fund managers and Are institutional investors any better at dealing with short-term underperformance?). Portfolios with high active share or concentration do not just create additional business risk for the managers that run them—they also create additional behavioral risk for the investors that hire them. Generally, relative performance and investor behavioral risk go hand in hand. Investors tend to redeem after periods of underperformance or miss rebalancing opportunities after periods of outperformance. The historical evidence associated with these hiring and firing decisions does not shed favorable light on the timing of their choices. Studies on manager hiring and firing show that investors tend to swap managers exhibiting recent underperformance in favor of managers that have done better, only to subsequently see the performance of the fired manager improve while the previously impressive results of the hired manager stall. Why would a fund manager reduce their overall profitability while at the same time potentially increasing the risk that they will lose clients if they experience a period of poor performance? They wouldn’t, which is why only a minority of fund managers – around 10% according to this research – actually manage money in such a way as to maximize the chances of their clients beating the market. Investors need to look for managers that clearly put the client’s needs first by investing in a way that has a high probability of making the client money. They are out there, but they are the minority. It’s also important to be patient. To combat potential behavioral missteps, investors should maintain their focus on aggregate portfolio results over full market cycles. Not every manager needs to outperform at all times. Previous 2015 – The year that active managers strike back? What are the EAFE active funds? EAFE = Europe, Africa and Far East. Essentially its world developed market equities minus the USA and Canada.